Mike Daly, Transaid Ambassador and Clipper Non-Executive Director; Chris Dolby, Head of Talent development at XPO Logistics; Martin Port, Founder and CEO of BigChange; and Alan Thornton, Commercial Director of W H Malcolm, were joined by Freelance Journalist Ian Norwell, and were welcomed to Zambia by Transaid’s Chief Executive, Caroline Barber, Corporate Partnerships Officer, Jade Ashby, and Project Manager, Victor Simfukwe. Together, the group made the 14 hour round trip from Lusaka to Serenje, where Transaid is working alongside a consortium of partners and the Zambian Ministry of Health to tackle severe malaria in children aged under six years old, by improving access to a new World Health Organisation (WHO) approved drug, rectal artesunate (RAS). In Serenje, the group were able to meet with a range of stakeholders: the District Health Management Team, local health facility staff, community health volunteers, emergency transport scheme (bicycle ambulance) riders, traditional leaders, and community members, including families whose children have survived severe malaria thanks to timely access to RAS and the injectable form of artesunate. “It was truly humbling, touching and extremely powerful to see the impact that the work is having on the people living in very remote and hard to reach communities,” commented Chris Dolby. On returning to Lusaka, the group were introduced to Transaid’s road safety and professional driver training programme, delivered in partnership with the Industrial Training Centre (ITC). 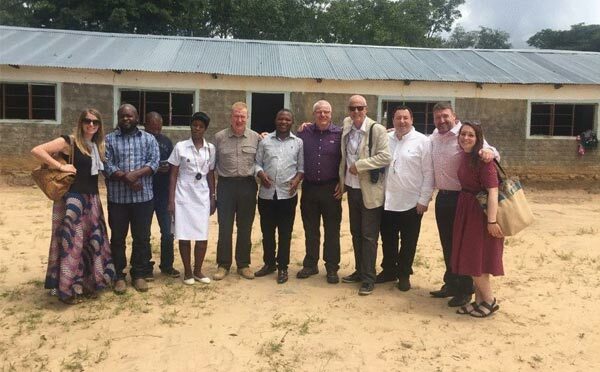 Here, they were invited to celebrate the formal handover of a training vehicle, donated by W H Malcolm, alongside all ITC staff, board members, students, trainers and the Zambian Ministry. Transaid’s corporate partners are crucial to our work. Without their support, whether that is financial, the donation of vehicles, the secondment of staff overseas or providing guidance, Transaid would struggle to achieve everything it does. We are delighted that some of our supporters were able to see our work on the ground.